Love ‘em or hate ‘em, there are as many ice climbing tool leash choices out there as there are tools. The most popular are the clipper style leashes. These come with a cuff that unclips from the tool. This easily lets you disconnect a hand to place screws, match tools, etc. Buy Ice Tool Leashes Now! Black Diamond makes the Android leash (clipper style) which will fit on any tool. Petzl and Grivel both make clippers that work well with their tools. When setting up your clip leashes, it is important to make sure that you can reach the head of your tool without having to unclip the leash. This will allow for easy transitions when mantling on ice or plunging in snow. Clipper leashes work well in the alpine, though there is the danger of dropping a tool because you will be completely unclipped from it at some point. To avoid this, you can either be careful, use an umbilical cord setup, or go with standard leashes. 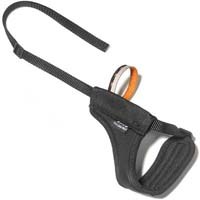 By far the most popular design for a standard leash is the lockdown. These glorified slip knots grab hold of your wrist nicely but can be easily loosened by hooking a special loop over the hammer. This style is a good and cheap alternative to clip leashes. As leashless tools have become commonplace on long routes and in the alpine, umbilical leashes have become a popular way to stay attached to them. An umbilical leash should have elastic cord running inside of a webbing sheath so that the leashes are less likely to tangle or tie themselves in knots. They should also have carabiners that are large enough to clip into the spike and the head of the tool (useful when climbing snow). A swivel at the harness attachment point is a nice touch, as it makes it easier to untwist as you swap tools throughout a pitch. Finally, you should attach the umbilical to your harness’ belay loop with either a webbing girth hitch, or a locking carabiner. Due to the variety of pulls that this attachment gets, a non-locking carabiner attachment will unclip every now and then. 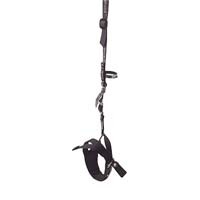 Currently the Black Diamond Spinner Leash is the only commercially produced umbilical. It is also possible to build your own umbilicals fairly easily: http://www.alpinedave.com/leashless_rig.htm. The result is very nice, but not quite as clean and slick as the BD.